Glenn is the medic who recently lost a leg after a heart attack and some unfortunate set of events. He has always given more than was asked of him, often being there after we have all left, helping Eric Ehrenreich and Chris van Niekerk pack up. With the loss of his leg, it has meant he has lost mobility to do his medics job as well as his other job of fixing automatic gearboxes. Glenn is divorced with two small kids. 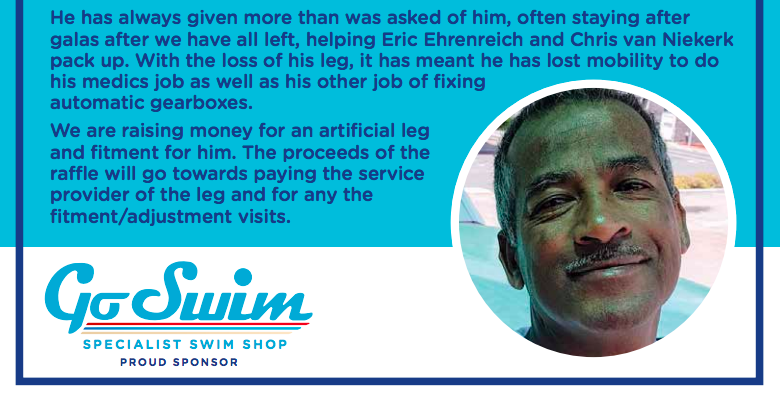 Our proposal, supported by coaches from 20+ clubs and SwimBoard, is to run a Glenn Petersen Benefit Gala which will raise money for an artificial leg and fitment for him. The proceeds of the gala will go into a separate account which will be used to pay the service provider of the leg and also pay towards fitment/adjustment visits. The bank account will be available for all clubs and donors to see. If you have any suggestions, please contact Gary Bonney or Eric Ehrenreich. — Keep it to 2 hours per session; juniors then seniors. Each swimmer is limited to 4 events in total across all sessions and entries may be capped based on the time allocation at the pool. Entry cost irrespective of number of events is R100 per swimmer. Facebook event – please share! Sponsor of prizes. Product or vouchers. Anyone want to be Main sponsor? Brochure / invite / web page design. Anyone want to run a tuck shop? Anyone prepared to put together a raffle? Any other ideas to raise money. Does anyone have contacts in the medical field? Prosthesis / artificial leg or know of a good supplier or can recommend a technician? Put together by partners: Vineyard Swimming Club, AquaWolf Aquatics Club, Westridge Swimming Club and OctaSphere lane ropes. 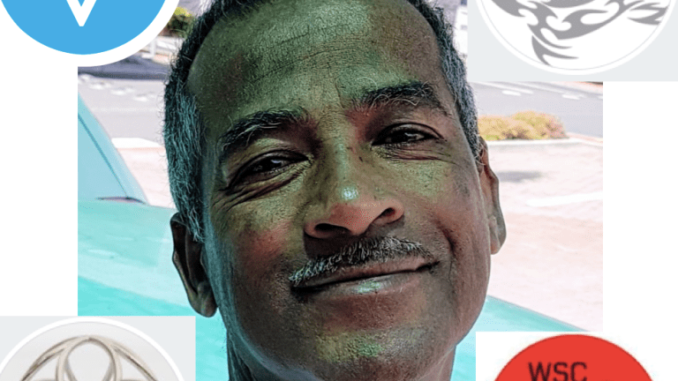 Glenn needs money now for petrol and cell phone pay-as-you-go so that he can get to the hospital for consultations and also continue (in a fashion) his transmission repair business. Club name must be placed on the raffle form. Each raffle form is to the value of R200,00. It would be wonderful if each club could do five sheets, but it is absolutely up to their own discretion whether they would like to support this worthy cause. Nobody is under any obligation. Monies can be paid directly into the account that has been created for Glen. Please also just send proof of payment to Gary Bonney as he will manage the deposits. We do need proof that payment has taken place for sheet in order to go into the lucky draw. Raffle draw will take place at the Benefit Gala. 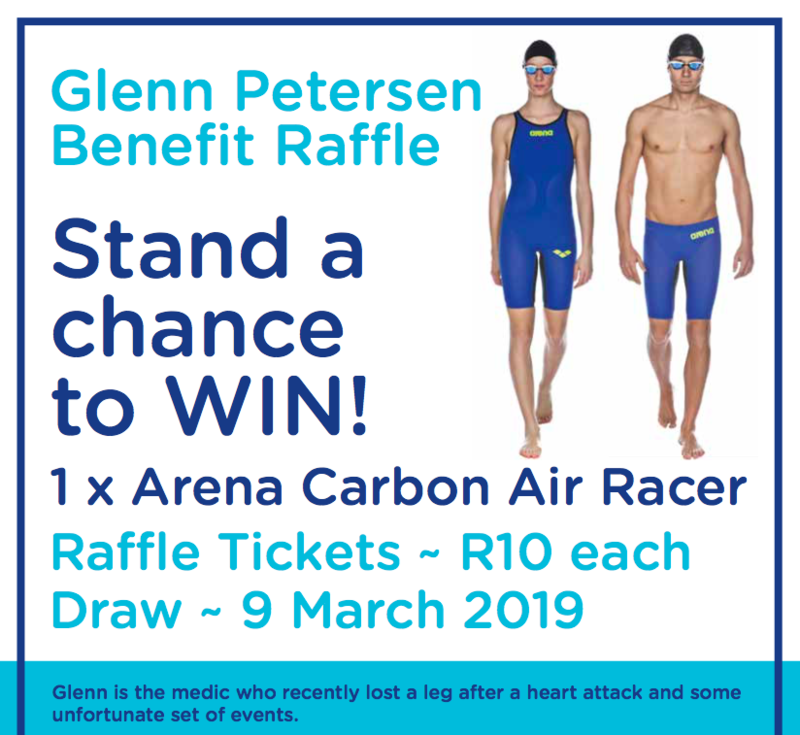 A gift voucher will be awarded to the winner to redeem at Go Swim for a male or Female Carbon Air.